Readying students to be workforce leaders and providing solutions to society’s big issues through research innovation are part of what it means to be a next-generation university. UNT’s Office of Innovation and Commercialization (OIC) is doing both with its new Patent Internship Program. Sandesh Somashekar graduated in May with a set of specialized but transferable skills that set him apart from his classmates and complement his M.S. in electrical engineering. University technology commercialization offices often employ interns who focus on the licensing and marketing aspects of technology transfer.However, these internships, often partnering with business schools, seldom emphasize the more detailed and technical aspects of innovation. UNT’s program differs by concentrating on intellectual property and is a collaboration between the OIC and the University Libraries. “The 50-50 partnership provides the students with twice the support,” says Michael Rondelli, associate vice president for Innovation and Commercialization. Steven Tudor, assistant director of licensing, manages the internship program for the OIC, and Yvonne Dooley, business information librarian, is the coordinator and mentor at the Eagle Commons Library. They say the partnership, which allows students to learn about IP and technology transfer, is unique among university internships. The interns gain rare experience in many areas that sets them apart from their classmates. They learn a specialized set of skills, from intellectual property evaluation and industry research to report writing and marketing analysis. These are hands-on skills that they cannot learn in the traditional classroom. The research, business and writing skills translate across many domains. Dooley teaches the interns how to conduct patent and business searches and provides support as they go deeper in the research for their assigned projects. She also helps them improve their writing skills, something lacking in many internship programs. Dooley, who previously worked for the Library of Congress in Washington, D.C., says Rondelli proposed the idea for a patent internship program before she even officially started her position at UNT. She was interviewing when Rondelli introduced his idea of a joint internship that would cross-train students and focus on intellectual property. “In the beginning, we weren’t quite sure how this would work,” Dooley says. Interns require a significant investment in mentoring, but students also can save time and resources for the campus offices in which they are employed. 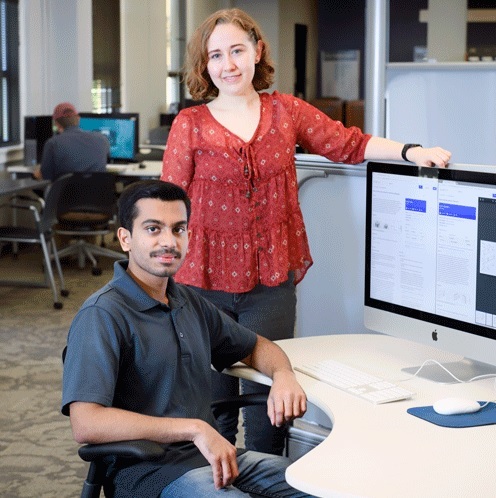 Somashekhar and fellow intern Sidney Hartz have exceeded their mentors’ expectations. The internship program is open to undergraduate and graduate students. Ideally, Tudor explains, interns would have overlapping tenures. This allows experienced participants to pass on their knowledge to newer interns to create a culture that builds upon itself. In addition to technology evaluations, Somashekhar and Hartz have identified potential industry partners for licensing and development of the technology. During his internship, Somashekhar marketed a cardiovascular stent developed by researchers at UNT. Because of his understanding of the technology gained from his patent searches, he was able to identify a number of companies that have expressed interest in the stent. Somashekhar started his internship in the fall of 2017. Hartz, an undergraduate mechanical and energy engineering major, joined Somashekhar in the library in January. She plans to continue working as an intern until she graduates next May. “I was looking for a position that would teach me new skills to help me work in renewable energy,” Hartz says. This is an important skill in patent research. Patents are notorious for being highly technical and difficult to decipher. Patent research requires an eye for very small details. Before a new technology can be licensed to an outside entity and commercialized, the intellectual property must be identified and protected. What exactly is the invention or technology? Which part is novel? Is it patentable? If so, what makes it different from other ideas already patented? Is the technology marketable? Some of these questions might not seem complicated to those who are inexperienced in reading patent applications, but patents often deal with very specific innovations in very specialized fields. “I am a huge technology enthusiast,” he says. Somashekhar is currently seeking an industry position, a search made easier by the research skills he learned during his internship. Although still a young program that continues to evolve, the Patent Internship Program has exceeded initial expectations. A third intern will join the program in September. Tudor and Dooley hope to present the program at a national library conference this fall, and Rondelli hopes to further the program’s growth by adding more students in coming semesters.